Made in Israel, it has 13 different shades of blue woven in the design. Tallit is a light wool and comes with a matching Tallit bag and kipah. 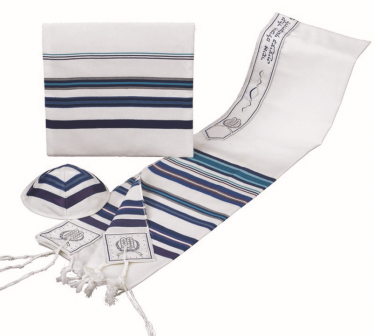 B'nai Or Tallit set includes tallit bag and kipah. Makes a wonderful set for anyone called to the Torah whether for a Bar Mitzvah or High Holidays.